At SIGHT OPTICAL we have lots of frame styles to choose from. Having a wide selection is great, but how do you narrow down the search to pick the right frame for your face? There are a few simple rules of thumb you can use to help narrow down your search. The most important step is to first determine what your face shape is and everything else falls into place from there. Generally speaking, faces can be broken down into five basic shapes. Oval, round, square, heart and triangle. Each one of these shapes has a good counterbalance matching the shape to help you get a good fit. Below you’ll find some examples to help narrow down that perfect pair of glasses. Oval shaped faces have a slightly curved jawline that is a little more narrow than the forehead and the check bones are high and angled. This is considered the most versatile face shape. 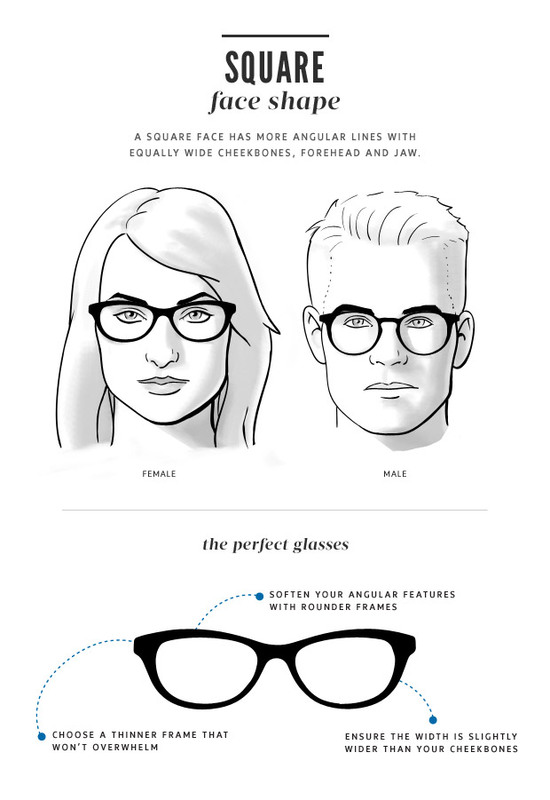 With this face shape your options are fairly open, both square and round frames would be complimentary. The only thing to avoid would be oversized frame shapes as they would take over the face and you would get lost behind them. Round faces have full cheeks, a wide forehead and a rounded chin. The best shapes for this face would be square or strong angular shapes to balance the overall look. Frames to avoid would be any small shape and frames that are too small to fit the head properly. Square shaped faces have a tendency to have a broad forehead, a strong horizontal jawline and are proportional in width and length. The best shape for these features would be something from the oval or round family. Dark and bold colors tend to look good on square shape faces as well. Frames to avoid would be square and geometric shapes. Heart shaped faces would have a broad forehead that extends down to a small chin and have high and angled check bones. Frames that work well for this face shape are oval and round shapes along with light colored thin frames to add balance. Avoid top heavy styles and dark colors. Triangle shape faces have wide cheekbones, a narrow forehead and an angular jawline. Faces like these work well with rimless style frame, oval shapes and anything with a strong brow line. Try to avoid very thin or narrow shaped frames. Along with these few simple guidelines and the expertly trained staff, you can confidently walk into SIGHT OPTICAL and know that you’ll get the perfect frame for your face. Come visit us today at 924 Cherry Street SE, Grand Rapids, MI and start seeing and looking your best.